Māori women working as fleece-os (who collect shorn wool) in shearing sheds rolled freshly shorn wool on their thighs and knitted it using fencing wire. This practice was known as uruahipi. In 1967, during Wairoa Wool Week, the waning practice was revived and re-christened 'Kiwicraft'. 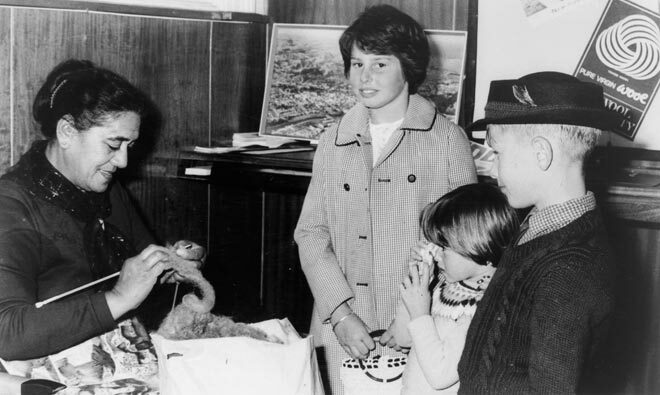 During the 1969 wool week Pani Whatuira (left) demonstrated it at a knitting display held at the New South Wales Bank in Gisborne. Helen, Kowhai and Stuart Cameron watched her at work.